Membership offers peace of mind for unexpected emergency transport expenses. Benefits cover you, your spouse or domestic partner, and dependents claimed on your income tax return. Elderly or disabled family members living in the same household are also covered. If transported, we simply bill your insurance. Program rules may vary by LifeRide partner. There may be no deductibles and no extra co-pays. LifeRide GROUND ONLY membership covers you and your household. 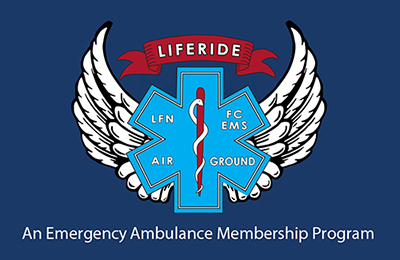 LifeRide GROUND+AIR membership includes all LifeRide Basic services as well as air medical transport coverage when transported under medically necessary emergent circumstances by Life Flight Network. By becoming a LifeRide member, you agree to the terms stated in the Statement of Understanding. New member benefits take effect 72 hours after receipt of completed application and payment. Life Flight Network transports patients based on medical need, not membership status. Medicaid beneficiaries should not apply for membership.